Condensing tankless technology uses the normally wasted exhaust gases to preheat incoming water. This has been on every one of Navien’s tankless water heaters since the beginning. The addition of the secondary heat exchanger adds about a 12-15 percent efficiency increase making a tankless water heater around 97-98 percent efficient. With one of these systems for every dollar you send on natural gas or propane 97-98 cents are actually used to heat your water. A conventional type water heater is somewhere around 50 percent efficient so literally half of every dollar you spend on fuel is thrown away. The Navien NPE series systems have an innovative twist to their condensing tankless. The burner and heat exchanger are flipped upside down and thus, when the burner kicks on flames shoot downward. This is completely opposite to most other condensing tankless manufacture designs who have designed their systems with flames that shoot upwards. Yes, it is actually counter intuitive as heat rises upwards so you would think naturally the burner should be at the bottom. I spent some time with a Navien representative and he thoroughly explained this (brilliant) engineering difference which I’ll try to explain it to you (hopefully as elegant as he was able to do). A condensing tankless has a substantial amount of water form on the outside of secondary heat exchanger where the exhaust gases are flowing past, this of course is what makes it a condensing tankless. With the presence of the exhaust the water is naturally acidic and will eat away at the heat exchanger over time. 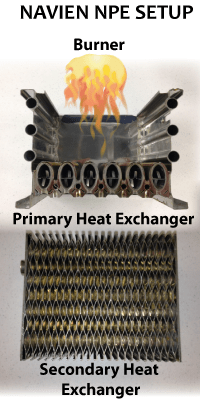 Navien having put the burner at the top with the secondary heat exchanger at the bottom prevents the condensate from dripping over the primary heat exchanger enhancing its lifespan. This design has been tested thoroughly by Navien and they offer the industries best heat exchanger warranty at 15 years. The best warranty you will find on a heat exchanger with other tankless systems is 12 years. We sell and service all makes and models of Navien condensing tankless water heaters. This is a brand we trust and a system that is personally owned by several of our staff. If you think a Navien might be right for your home give us a call to discuss.